You must configure basic network, host, and user settings, and you must upload a license file to activate the appliance, before you can install a Tanium Appliance role. License A special physical appliance license type must be issued. The same license file is used to activate all of the Tanium appliances in your deployment. Your TAM must know the fully qualified domain names (FQDN) for each of them in order to generate your license file. Network Be ready to specify the static IP address, subnet mask (dotted-decimal), default gateway IP address, hostname, domain name, primary and secondary DNS servers, and NTP server(s). The Tanium Appliance Quick Start Guide describes how to install the appliance into a machine room and configure bootstrap network settings so that you can make a remote SSH connection and complete the setup and Appliance role installation from your desk. The Quick Start steps are repeated here to give context to the starting point for your initial workflows. You do not need to complete them twice. The Quick Start steps can be completed by a restricted user (tanuser) who does not have privileges required to install or manage Tanium servers or by the privileged user (tanadmin). Connect a keyboard, video, and mouse (KVM) to the console port. Obtain an IPv4 address from your network administrator and be prepared to specify the IP address, subnet mask (dotted-decimal), and default gateway IP address. The boot and start-up processes take a few minutes. When prompted to log in, specify the user name tanuser and the default password Tanium1. When prompted, indicate that you want to configure temporary settings. Specify the IPv4 address, subnet mask, and default gateway IP address. The TanOS console confirms that the settings are applied and logs you out. Network and host settings enable the appliance to establish connections with other computers in your local network and with other servers and hosts on the Internet. Specify appropriate settings for the network in which the appliance is deployed. Your local "management computer" must be connected to a subnet that can reach the appliance IP address. Your management computer must have an SSH client application or terminal emulator that can make a client connection to the appliance. You must have an SSH client such as PuTTY to log into the TanOS console. The latest version of PuTTY was used in testing. Issues have been reported when using earlier versions of PuTTY. 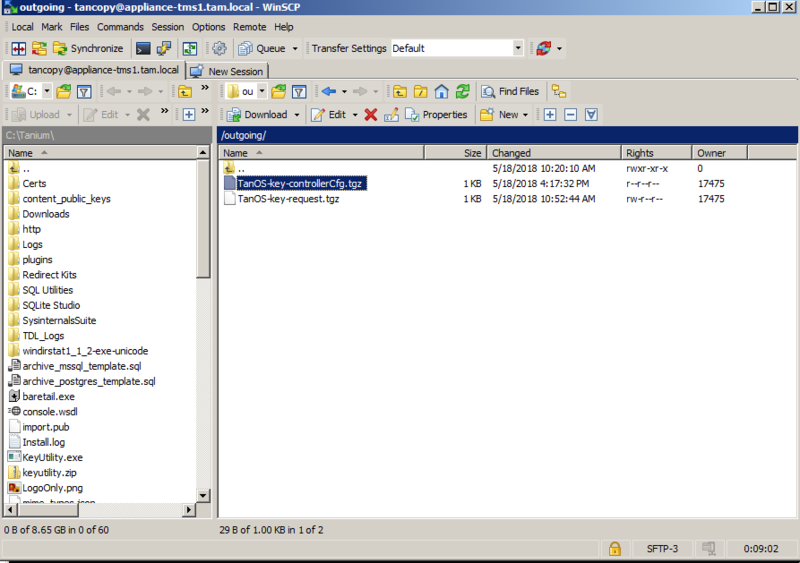 You must have an SFTP client such as WinSCP to copy files to and from the appliance. 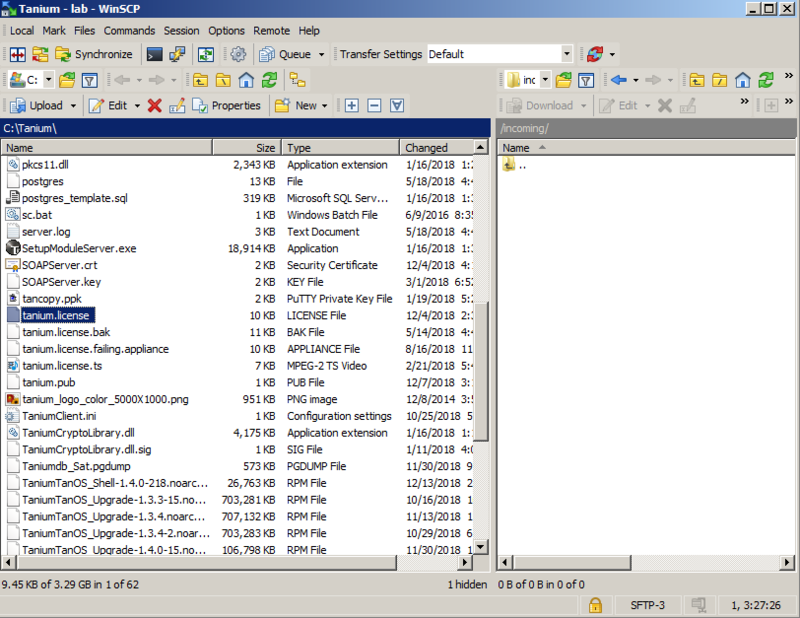 The latest version of WinSCP was used in testing. Watch the tutorial on setting up WinSCP for the Tanium Appliance on the Tanium Community website. Make an SSH connection to the appliance IP address that was configured in the previous step. When prompted to log in, specify the user name tanadmin and the default password Tanium1. When prompted, indicate that you want to complete the initial configuration. Use the spacebar to page through the end-user license agreement (EULA); enter your email address to accept it. The email address is stored locally only. It is not used externally for any reason. Specify network and host configuration settings. Time zone is set to UTC automatically. When prompted, specify whether you want to enable and configure the tanfactory user. The tanfactory user is a special account that has one capability—performing a factory reset. When prompted, enter the one-time password that is displayed on the screen for the tanadmin and tanuser users. Make a note of the one-time password. You must provide it the next time you log in. At that time, you will be prompted to specify a new password. The console displays a notice that the initial configuration workflow has been completed and that the session will be terminated. TanOS has a few built-in user accounts that you use to access the appliance operating system and perform tasks. tanuser: Can make an SSH connection with SSH key authentication or password authentication to the TanOS console and access temporary settings and status menus only. tanadmin: Can make an SSH connection with SSH key authentication or password authentication to the TanOS console and access all menus. tancopy: Can make an SFTP connection with SSH key authentication to TanOS and copy files to and from the /incoming and /outgoing directories. Tanium strongly recommends that you set up both SSH key authentication and password authentication for TanOS user accounts. TanOS does not support self-service password reset methods. If you forget your password, you must ask a tanadmin user to reset it for you. If all tanadmin users are locked out, you must log in as the tanfactory user and perform a factory reset. You can avoid this risk by setting up both authentication types. Watch the tutorial on configuring SSH key authentication for the Tanium Appliance on the Tanium Community website. Be ready to specify new passwords for the tanuser and tanadmin accounts. The password string must be at least 10 characters long and have at least 1 uppercase character, 1 lowercase character, 1 numeric character, and 1 nonalphanumeric character. You must have an SSH client to log into the TanOS console and an SFTP client to copy files to and from the appliance. You must have an SSH key generator to generate keys for the tancopy user. Open an SSH connection to the TanOS console as tanadmin and then follow the prompts to change the password. To complete the change, the session is terminated. Open an SSH connection to the TanOS console as tanuser and then follow the prompts to change the password. You must set up an SSH key for the tancopy user. Tanium strongly recommends that you set up both password authentication and SSH key authentication for TanOS user accounts. You must set up an SSH key for the tancopy user. The SSH key is used when you transfer files via SFTP to the /incoming and /outgoing folders. This procedure adds an authorized key for the tancopy user to the appliance configuration. The purpose of this key is to enable you to use an SFTP client on your management computer to copy files to the /incoming and from the /outgoing directories on the appliance. In the Tanium Module Server and HA active-active installations, you are instructed to add a different authorized key for the tancopy user. Be careful not to mistake one for the other. The authorized keys serve different purposes. Both are required. Specify an RSA key with 2048 bits. Specify a passphrase that is easy to remember. Save the private key to a location you can access later when you set up your SFTP client. In an SSH key exchange, the keys must match precisely as expected, including line endings. For this reason, the PuTTy documentation recommends loading the key in PuTTYgen and copying it from the Public key for pasting... box instead of copying it from an open file. Enter 2 and then follow the prompts to paste the public key generated in Step 1. Specify tancopy for user name. Under SSH, browse and select the private key that pairs with the public key uploaded to the appliance. Save the configuration and click Login to initiate the connection. You should be able to connect to the appliance /incoming and /outgoing directories. You might see permission denied messages because WinSCP attempts to read the listing of the /incoming directory. This is expected. The user tancopy has permission to write to /incoming but not read /incoming. Tanium strongly recommends that you set up both password authentication and SSH key authentication for TanOS user accounts. Save the private key to a location you can access later when you set up your SSH client. Enter the line number for the tanadmin user to display the key management menu for this user. Specify the Tanium Server IP address, port 22, and SSH connection type. Open the SSH session and enter the tanadmin username. You are prompted for the SSH key passphrase instead of the tanadmin password. After you complete the initial network configuration, you are prompted to upload a valid Tanium license file or request an activation key from Tanium. Until you complete the activation process, you have limited access to TanOS menus. You can manage the network and user configuration, but you do not have access to menus for Tanium roles until you have completed activation. Upload a valid license to activate the physical appliance and gain access to all of the TanOS menus. Obtain a valid license from your Tanium technical account manager (TAM). The same license file is used to activate all of the Tanium appliances in your deployment. Your TAM must know the fully qualified domain names (FQDN) for each of them in order to generate your license file. The license file is named tanium.license. The license is not expired. The FQDN that was specified in the Tanium license generator matches the FQDN of the appliance. You must have added the public key for the tancopy user to the appliance so you can use SFTP to upload the license file. 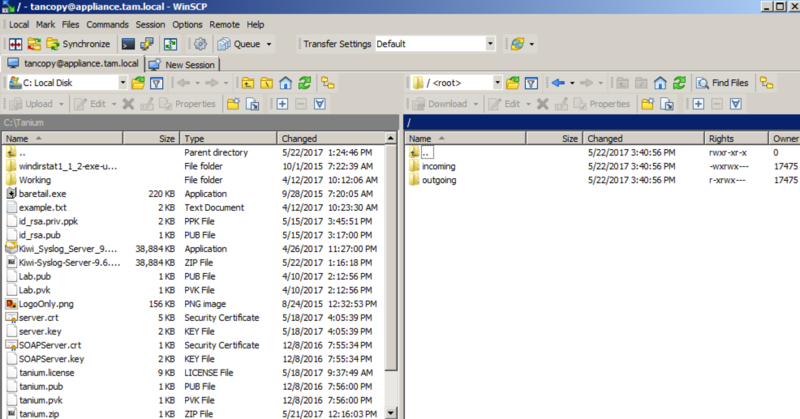 On your management computer, set up an SFTP client such as WinSCP to connect to the appliance. Use SFTP to copy your license file (tanium.license) to the /incoming directory on the appliance. TanOS detects the license and copies it to the appropriate location in order to activate the appliance. When you go to the main menu, notice that the activation notice has been cleared, and you can access all menus. On the tanadmin menu, the Activation line indicates the appliance was activated with a License File. The RAID controller security key is used by the controller to lock and unlock access to encryption-capable physical disks. You can export the key and store it in a safe location. During recovery from controller failure, you will need to provide the key. When you run a Health Check, you might see messages alerting you to export the RAID controller security key. Enter B to go to the Appliance Maintenance menu. Enter C to go to the Maintenance Mode menu. Enter 1 and follow the prompts to toggle on Maintenance Mode. Return to the tanadmin menu and enter A to display the Appliance Configuration menu. Enter X and follow the prompts to display the Advanced Configuration menu. Enter 5 and follow the prompts to export the RAID controller security key to the /outgoing folder. From the Maintenance Mode menu, enter 2 and follow the prompts to toggle off Maintenance Mode. Use SFTP to copy the file from the /outgoing directory to your local computer. Files copied to the /outgoing folder are deleted every day at 02:00 AM. It is, therefore, of critical importance that you copy the RAID controller security key file from the /outgoing directory to your local computer immediately after you have used the TanOS menu to export it and save it in a protected location. If you lose the RAID controller key file, you can return to the Advanced Menu and select option 4 to change the RAID controller key. The default name of the RAID controller key file is TanOS-key-controller-Cfg.tgz. It is recommended to change the name to include the hostname or serial number of the appliance it came from before you store it. You likely have more than one appliance, so a name based on unique hostname or serial number is useful if you later need to locate the correct file. The grub key can be used during the boot sequence to diagnose and recover from failure conditions. You can export the key and store it in a safe location. During recovery, you will need to provide the key. Enter 6 and follow the prompts to export the grub key to the /outgoing folder. Create additional TanOS system users based on tanadmin (privileged) and tanuser (restricted) profiles. It is useful to have more than one privileged user in case you forget the password for the initial tanadmin user. To save time, Tanium recommends you complete advanced network configuration, such as NIC teaming and static routes, before you install Tanium servers. See Reference: Appliance configuration. When these steps are completed, or if none of them apply, you can continue with the installation of a Tanium role (for example, All-in-One, Tanium Server, Tanium Module Server, or Tanium Zone Server).